What Else Can I Expect from an Online Bachelor's in Corrections Program? The broad, interdisciplinary field of criminal justice explores laws, law enforcement and the justice system. Corrections is a niche area of criminal justice dedicated to the punishment, treatment, supervision and rehabilitation of individuals who have been convicted of different crimes. Specifically, corrections personnel oversee and assist criminal offenders during three key phases: incarceration, or imprisonment; parole, or conditional release from prison once a sentence has been completed or commuted; and probation, a period of close supervision usually granted to a convicted criminal in lieu of actual jail time. Some correctional employees serve as guards and attendants at prisons (which are also known as correctional institutions), while others work with released offenders as parole or probation officers. Many corrections professionals begin their careers at the collegiate level by earning an undergraduate degree from an accredited institution. In most cases, this will take the form of a bachelor's in criminal science with a concentration in corrections. These programs will introduce students to the laws, ethics and most popular strategies guiding today's corrections field. Corrections bachelor's pathways often include internships or practicum courses, which allow students to receive hands-on training from experienced professionals. Many of today's students are choosing to earn their corrections bachelor's degree online, rather than in a classroom. Web-based students follow the same rigorous curriculum as their brick-and-mortar counterparts, leading to a comparable number of post-graduation job opportunities. The asynchronous (or self-paced) schedule of most online corrections degree programs is also ideal for students with part-time jobs, childcare duties and other commitments that may conflict with campus-based learning. Learn more about what you can do with a bachelor's degree in corrections and what kind of career opportunities you can look forward to with this comprehensive guide. WILL AN ONLINE BACHELOR'S IN CORRECTIONS PROGRAM PROVIDE ME WITH THE SKILLS I NEED TO ADVANCE MY CAREER? A bachelor's degree in corrections will prepare students for this demanding -- yet equally rewarding -- profession. The coursework will cover legal protocols and procedures for the incarceration, parole and probation of convicted offenders, as well as some best-practice approaches to communicating and interacting with these individuals. The curriculum will also incorporate history, anthropology, sociology, psychology and other social sciences that have bearing in the criminal justice field. Internships and practicum courses also enable students to apply the knowledge and skills they have gained in a real-world correctional setting. WILL AN ONLINE BACHELOR'S IN CORRECTIONS WORK WITH MY SCHEDULE? Online bachelor's degree programs in corrections offer a flexible alternative to traditional college learning. Students can access lectures and other course materials, participate in virtual discussions with fellow students, submit written assignments, take exams and communicate with their professors on their own time from their home computer. Current educational technology also allows them to study away from their desk using a laptop, tablet, smartphone and other Wi-Fi-compatible devices. For added convenience, online students can typically coordinate internships at sites that are reasonably close to their current residence. WHAT JOBS CAN I GET WITH MY BACHELOR'S IN CORRECTIONS? Many careers in corrections are attainable with an associate degree -- and in some cases, a high school diploma -- so those with a bachelor's degree will be well-positioned to enter the job market. Common professional titles for corrections degree-holders include correctional officers and jailers, parole and probation officers, bailiffs and correctional treatment specialists. The bachelor's degree may also serve as a stepping-stone for those who wish to advance to graduate school and study to become criminal justice teachers at the collegiate level. WHAT ARE THE BEST ONLINE BACHELOR'S IN CORRECTIONS PROGRAMS? Choosing a program is an incredibly personal decision, and only you can properly evaluate whether a target school's strengths match your educational needs. 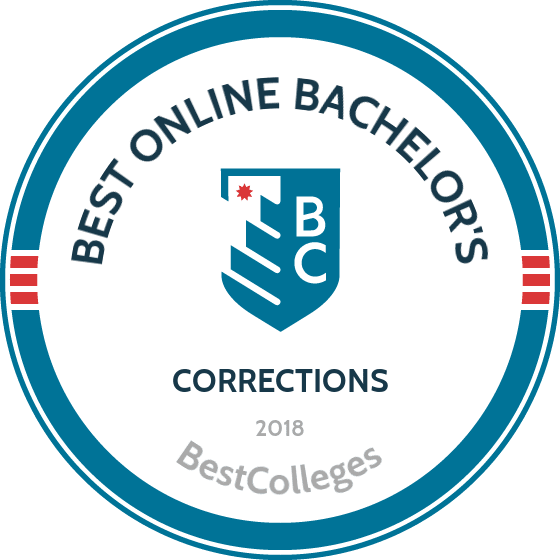 The following ranked list of schools should serve as a helpful starting point in your search for the best online bachelor's in corrections programs in the United States. Our ranking is based on the courses schools offer, available specializations, student outcomes, career support services, and other criteria used to determine academic excellence. If you are considering an online bachelor's in corrections, be sure to contact admissions specialists at different colleges and universities to learn more their about specific bachelor's degree requirements and offerings. Located in Irvine, California, Brandman University was established in 1958 as a school for military personnel. Today, the university continues to serve the needs of adult learners through its distance education programs, which includes an online bachelor of arts in criminal justice. Degree candidates develop critical analysis and effective communication skills along with a keen knowledge of criminal law and politics. Students may opt to earn their degree entirely online or through a hybrid curriculum, mixing in flexible night and weekend courses on campus. Students must complete 120 credits to graduate. Required major coursework notwithstanding, students can choose from six concentration areas, including homeland security, forensics, and victim advocacy/social justice. Applicants must have at least 12 transferable college credits with a minimum 2.0 undergraduate GPA in order to qualify for admission. You also need to submit official transcripts and complete an application through Brandman. The University of Massachusetts Lowell offers over 100 degree programs through its six colleges, including distance education options like the bachelor of science in criminal justice and criminology with a concentration in corrections. Four other concentrations in police, violence, homeland security, or crime and mental health are also available. Combining holistic liberal arts learning approaches with skill-developing projects grounded in the criminal justice system and pertinent social challenges, a UMass Lowell degree prepares students for further education or careers in cybersecurity, forensic science, national defense, and other fields. To earn their BS, students must complete 120 credits of coursework with a cumulative 2.2 GPA or better. Required classes for the corrections concentration include institutional corrections, crime mapping, and community-based corrections. The UMass Lowell program stands out from other online corrections programs for its emphasis on professional development. Distance learners may engage with organizations like the Victims’ Issues Projects, thereby gaining valuable work experience and networking opportunities. Eastern Kentucky University is known for offering some of the most comprehensive online education programs in the nation. Consistently ranked among the best schools for distance learning, the university's commitment to accessibility has shaped a flexible online bachelor's in corrections program geared toward adult learners with or without a background in the field. This 120-hour corrections and juvenile justice studies program offers accelerated eight week terms that begin six times a year. While core courses provide students with a solid foundation in criminal justice studies, the program's unique emphasis on juvenile topics makes the program ideal for anyone pursuing a career in youth corrections or counseling. Drawing from multiple disciplines, electives expand on contemporary topics in criminal justice, including capital punishment, female offenders, and the needs of a diverse inmate population. In a final capstone seminar, seniors must synthesize their acquired knowledge in a comprehensive research paper to earn their correctional officer degree. North Carolina Central University regularly earns praise for the affordability and excellence of its distance education offerings. Included in this list of award-winning degree programs is an online bachelor of science in criminal justice with a concentration in corrections. The NCCU programs provide students with theoretical and practical knowledge of the American criminal justice system, including its history, structures, and current challenges like equitable law enforcement and mass incarceration. Students must complete 120 credits, which can all be earned online through asynchronous coursework. Major topics include juvenile justice, ethics and diversity in criminal justice, and research methods seminar and lab. Distance learners at NCCU enjoy a variety of support services, such as online tutoring through the Upswing writing studio as well as career services. Located in St. Charles, Missouri, Lindenwood University offers a robust distance education platform with the benefits of a private university. Online students have access to several degree programs, including a bachelor of arts in criminal justice with an emphasis in either corrections/juvenile or corrections/probation and parole. Degree candidates learn to analyze the nature of criminal behavior and institutional reactions to such violations. The 120-credit curriculum includes courses in social deviance, abnormal psychology, and inclusive and therapeutic recreation. Students round out their education with foreign language classes and advanced topics in their emphasis area. To apply, candidates must submit academic records with a minimum undergraduate 2.5 GPA (2.0 for transfer applicants) and standardized test scores: at least 20 for the ACT and 1020 for the SAT. Southern New Hampshire University is one of the fastest growing institutions of higher education in the U.S., enrolling more than 70,000 distance learners every year. Students can pursue a fully remote bachelor of science in criminal justice with a concentration in corrections. SNHU prepares students for professional advancement through a curriculum that engages them with the full range of services and procedure in corrections, including community-based treatment, as well as the social effects surrounding crime and punishment. The degree plan totals 120 credits and courses are structured asynchronously in flexible eight-week sessions. In addition to free electives and a capstone project, students take major coursework like international criminal justice, offender rehabilitation, and correctional administration. All distance learners pay the same affordable tuition regardless of where they reside. SNHU accepts up to 90 transfer credits towards degree completion. West Texas A&M University serves the communities around the Panhandle area by providing accessible professional development and academic degree programs. WTAMU boasts integrative distance education options, including two tracks for students who want to pursue careers in corrections. The online bachelor of arts or bachelor of science in criminal justice with an emphasis in corrections pathways trains students in the diverse skills required to work in the U.S. correctional system. From investigating a crime scene and conducting legal searches, to planning a departmental budget and managing rehabilitation services, students apply theoretical and practical knowledge for a well-rounded education. The BA and BS degree plans both total 120 credits and students take largely the same major coursework, including crime in America, the constitutional rights of the accused, and racial and cultural minorities. Both online corrections programs also require students to complete a capstone. Considered one of the most affordable schools for distance education, Bemidji State University of Bemidji, Minnesota, offers an online degree for a bachelor of science in criminal justice with a corrections emphasis. Designed to give students a well-rounded education in the prevention and investigation of crime as well as the treatment and rehabilitation of offenders, BSU's program prepares them for positions as customs inspection officers, court administrators, and asset protection specialists. To apply, candidates must have at least 24 transferable university credits. Military training is evaluated on an individual basis for credit equivalency. The program requires students to complete 48 credits over two years. Major coursework includes topics like the judicial process, intercultural communication, and principles of criminal justice supervision. Students must also complete a capstone directed group study where they analyze recent developments in criminal justice. All distance learners pay the same low tuition rate and financial aid is available, including scholarships specifically for transfer students. Founded in 1875, Park University provides 46 undergraduate degree programs, including an online bachelor of science in criminal justice with a corrections concentration. Park University's curriculum helps students develop a theoretical knowledge of criminology along with practical administrative and communication skills. The 121-credit program includes courses in criminal procedure; agency administration; and probation, parole, and community corrections. Degree candidates also complete a capstone experience, choosing either an internship or a research writing project. Distance learners at Park enjoy a variety of academic resources, including personalized advising and financial assistance. Students can prepare for future correctional officer jobs with guidance from Park’s Career Development Center, which offers help with job searches, resume workshops, and professional development. Regent offers a bachelor of science in criminal justice with a concentration in corrections. The program incorporates a Christian worldview in its curriculum, emphasizing ethics and critical thinking. Students graduate with in-depth knowledge of the criminal justice system and issues of national and international safety. All courses can be taken online through asynchronous eight-week sessions. Students must complete 120 credits to graduate. Degree candidates take classes in criminal investigation, constitutional law, and comparative criminal justice systems. Additionally, students must complete an internship with a social/criminal justice organization. The online tuition rate is low, which, when coupled with scholarship opportunities, makes Regent one of the most affordable online corrections programs in the country. Distance learners don’t need to submit standardized test scores as part of the admission process. Cameron University is located in Lawton, Oklahoma and offers more than 50 academic pathways for traditional and distance learners. Online programs are facilitated through Blackboard and include a bachelor of science in criminal justice with a corrections concentration. Students learn the ethical theories and historical background concerning the U.S. criminal justice system as well as recent challenges and amendments. The 124-credit program includes courses in counseling adult and juvenile offenders, theories of crime, and research methods and statistics. Students must also complete a capstone seminar, where they can explore recent developments in the field. To apply, candidates must have a minimum 2.7 undergraduate GPA and have test scores of either 20 for the ACT or 940 for the SAT. Adult applicants are exempt from GPA and testing requirements, but will need to take assessment exams to ensure college readiness. Established in 1893, Western New Mexico University now enrolls over 3,500 students in its campus-based and online academic programs. Distance learners have several degree options, including a fully online bachelor of science in criminal justice corrections. Through this interdisciplinary program, students learn the theoretical knowledge and hands-on management skills that lead to careers in government agencies, community rehabilitation programs, and private security operations. Distance learners must complete 120 credits. Major coursework covers criminal justice professional skills, institutional corrections, and police and society. Distance learners enjoy access to support services like academic success counseling and technology assistance. They may also opt to engage in networking and professional development opportunities with one of many organizations at WNMU, like the student-run criminal justice club or Alpha Phi Sigma, the national criminal justice honor society. Located in Henniker, New Hampshire, New England College is a private, regionally accredited institution that offers a comprehensive list of academic programs, including distance education options like the online bachelor of arts in criminal justice with a concentration in institutional and community-based corrections. The NEC program stands out among other online corrections programs for its focus on rehabilitation and social justice initiatives, which aligns with current movements in the field. The entire degree can be earned online through asynchronous coursework. The 120-credit curriculum includes classes in contemporary law enforcement, statistics for the social sciences, and legal and policy issues in corrections administration. Students have 32 elective hours, which they can use to earn a complementary minor in another concentration of criminal justice, or psychology. Those who plan to move on to a graduate degree program are strongly advised to complete a thesis. Founded in 1888, Tiffin University strives to provide flexible, professionally-focused online programs for distance learners seeking to jump-start their careers. This accredited, Ohio-based institution offers an online bachelor of criminal justice in corrections program taught by professors with strong academic backgrounds and extensive hands-on experience in the field. Drawing from this unique expertise as well as the latest innovations in theory, students acquire a broad knowledge base in criminal justice topics while developing a professional specialization. Corrections major courses highlight recent developments in theory and policy and draw directly from faculty experience, placing special emphasis on the corrections officer's role in larger society. All online classes are offered in seven week terms that begin six times a year, and the 121 credit hour correctional officer degree program can be completed in as little as 18 months. Most Tiffin students receive some form of financial aid. Established in 1915, Missouri Western State University serves students with a quality and affordable education. The school, located in St. Joseph, provides a growing number of online options, such as the 124-credit bachelor of science in criminal justice with an emphasis in corrections. The degree teaches law enforcement professionals theoretical knowledge and best practices in the field. The major includes the study of criminal law, criminal investigations, juvenile justice, and research in criminal justice. The online correctional officer degree delves into the concentration with the study of penology and corrections, probation and parole, administration and planning, and civil rights law. A supervised practicum requires 135 hours at a legal agency, during which interns engage in applied learning experiences to acquire hands-on knowledge. Admission requirements include a high school diploma or GED and SAT or ACT scores. There is no programmatic accreditation for this major field of study. Students should defer to the regional/national accreditation of their four-year college or university. The job outlook for corrections bachelor's degree-holders is somewhat mixed. On one hand, their strong academic background will allow them to compete for top jobs against candidates who complete their education with associates degrees or high school diplomas. According to the Bureau of Labor Statistics (BLS), individuals with a bachelor's degree face an unemployment of 2.8%; by comparison, associate degree- and high school diploma-holders face unemployment rates of 3.8% and 5.0%, respectively. The unemployment rate for bachelor's recipients is also much lower than the national average for all occupations, which currently sits at 4.7%. However, the BLS projects below-average job growth in the coming years for some of the most prominent correctional occupations. The following table looks at job growth estimates for some of these professions. Students who earn a bachelor's degree in corrections and other criminal justice fields enjoy higher earning potential than those who complete their education with an associate degree in criminal justice. Using data from the 2016-17 PayScale College Salary Report, the table below looks at earning expectations for both of these degree-holders at two career benchmarks. As the table indicates, those with a bachelor's in criminal justice outearn their associate-holding counterparts by roughly 19% at the entry-level mark and 28.5% at the mid-career mark. However, salary expectations for employees with a bachelor's degree in corrections will also depend on their specific job title, as well as their experience level and their city/state of employment. The next table looks at career salary growth rates for five of the most popular corrections career pathways. All five occupations listed reported 20-year salary growth of at least 28.6%. Probation officers and correctional treatment specialists experience the highest growth rate: a 77.8% earnings increase between the entry-level and late-career stages. Parole officers placed second with 52.5% career growth, followed by correctional officers with 48.6% growth. Students who graduate with an online corrections bachelor's degree will be qualified for dozens of positions dealing with the incarceration, parole and probation of convicted criminals. Four common career paths are outlined below. Probation Officers and Correctional Treatment Specialists: Probation officers work with probationers, or convicted criminals who are allowed to remain out of jail but must be closely supervised. Probationers are legally required to meet with their assigned officers to go over the conditions of their sentencing and receive evaluations. Correctional treatment specialists (also known as case managers) provide the same service for inmates at prisons who plan to be paroled. Correctional Officers and Jailers: Correctional officers and jailers supervise inmates at jails and prisons, and enforce rules and regulations. They are also responsible for ensuring that all inmates remain safe and secure for the duration of their incarceration. Most correctional officers and jailers receive academy-based training that follows guidelines from the American Correctional Association. Bailiffs: Bailiffs maintain order, safety and security in courtrooms during trials, sentencing and other legal proceedings. They typically have a background in law enforcement, and as part of their job, they must be trained to subdue, disarm and arrest individuals if the need arises. Criminal Justice and Law Enforcement Teachers, Postsecondary: These educators lead courses in criminal justice and law enforcement at colleges, universities and other postsecondary learning institutions. Most collegiate teaching positions are attainable with a master's degree or higher. Many criminal justice bachelor's degree recipients choose to continue their education with a master's program. For more information on this option, please visit our Online Master's in Criminal Justice Guide. Making professional connections and learning about different approaches to corrections is crucial to your success. Professional organizations offer a great entry point for students who want to learn more about their chosen career path. Below you'll find three of the country's most prominent organizations established for corrections professionals. These organizations host networking events, provide online trainings, maintain active job boards, and offer other services for career-ready college graduates. American Correctional Association: Founded as the National Prison Association in 1870, the ACA is today one of the leading voices in the training and professional development of corrections professionals. Perks for members include complimentary magazine and newsletter subscriptions, invitations to networking opportunities and discounts on continuing ed courses and other programs. Correctional Peace Officers Association: This nonprofit created in 1984 is dedicated to the spouses, children and other family members of correctional officers who lose their lives in the line of duty. CPOAs programs include an annual charity golf tournament and a scholarship program for children of slain officers who plan to attend college. American Probation and Parole Association: APPA represents probation and parole personnel working with criminals and juvenile offenders. The organization's website features an extensive online resource library, as well as links to online and onsite training programs.